If you walk down the dog food aisle of the market, you will see a myriad of choices when it comes to pet food. Selecting the right dog food can take some thought. How do you know you are selecting the right food for your pooch? Before grabbing a can or bag of dog food off the shelf, think about the characteristics of your dog, so you can find food tailored to his needs. If you are not certain about your dog’s health or the dog is a new part of the family, the first step may be a visit to the vet. When the vet examines your dog, he will be able to recommend food based on your dog’s health issues, age, size, activity level and other factors. Puppies need food that promotes growth, so they need more protein and amino acids. Pregnant and larger dogs require a lot of calcium. Active dogs and puppies burn up fat more quickly than older dogs. Therefore, energetic dogs and puppies can have dog food that contains more fat and carbohydrates to give them energy. On the other hand, neutered and older dogs are often less active and should have food that is lower in fat. Humans often read labels when purchasing food for themselves. Reading pet food labels can help you decide on healthy food options for your dog. Ingredients posted near the top of the label are the main ingredients in the dog food. Check to make sure that the ingredients contain nutrients and do not appear to be fillers. For example, corn or wheat is not as nutritious as meat. Then examine whether you can identify exactly what is in the dog food. Some dog foods contain by-products that may include parts of animals that are not actually meat. The Association of American Feed Control Officials (AAFCO) created a chart indicating minimal requirements for dog food that is identified as “complete and balanced”. Compare the ingredients to the chart to determine how your dog food stacks up. Whatever dog food is selected, pet owners need durable pet bowls that conveniently hold food without slipping or sliding. Essenti Enterprises, LLC offers a variety of pet bowls that are washable, sturdy and perfect for any size dog. We also offer travel pet bowls that fit in your back pocket of your pant. Purchase our pet bowls today. Besides reducing weight, walking has many other health benefits. It helps maintain a healthy heart, tones and firms muscles and decreases blood pressure. Regular exercise can make you feel more energetic and positive. Additionally, walking with your dog makes you approachable and can promote friendships. Furthermore, walking is affordable, safe and can be done virtually anywhere. A survey funded by Pet Health Care found that pet owners who walk their dogs get more exercise than many people who have gym memberships. The ease of dog walking and pleasure associated with it motivates pet owners to walk whereas going to the gym can be viewed as work. Furthermore, unlike a human who may not always be in the mood to exercise, a dog will usually welcome the opportunity to get fresh air and a walk. Some dog owners even use their dogs as training companions for races, but be aware that different breeds and temperaments make certain dogs better suited as serious running companions. However, when you walk or run with your dog, you want to make sure that he stays safe. Whenever you walk outdoors, there are cars, dogs, people and other distractions that can scare your dog or put him in danger. Additionally, many communities require owners to walk dogs on leashes. 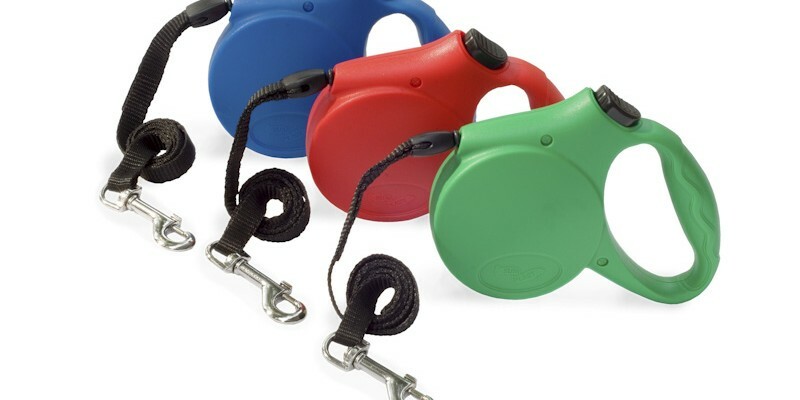 Essenti Enterprises, LLC carries a full line of durable retractable leashes that allow owners to give dogs more room to roam when it is safe, but at the same time, limit lead room when their pets need to be restricted. Browse our selection of comfortable, sturdy retractable leashes that are sized for small, medium and large dogs. Although it is tempting to let your canine jump in the car and go cruising down the highway, preparing him and your car for the ride can make your travel more pleasant for both of you. If you are taking a longer trip, take your dog to the vet so you have updated medical records with you when traveling. Discuss any concerns about traveling with your dog. Some dogs may get motion sickness so your vet may be able to prescribe medication or suggest ways to minimize motion sickness. Clean your car. You do not want your dog to eat stray objects and choke. In fact, avoid allowing your dog to freely move around your car. Purchase a harness or restraint so he does not roam around your car. This will keep him from distracting you while you are driving and will also protect him if you are involved in an accident. Bring a leash, dog food, water, and toys on the trip. Plan on taking frequent breaks, especially on longer drives. Your dog will want to get out of the car periodically and take care of his needs. Keep the windows closed. You have probably seen a dog happily enjoying the fresh air as a vehicle moves down the roadway. However, debris can fly and hit injure your dog’s face or body. Make sure your dog is wearing a collar and tags. If you are in an accident or he runs away when you are taking a driving break, you will want to be able to identify him. In case he gets lost, keep a current picture of your dog in the car. Essenti has pet bowls, retractable leashes and toys that can help make it easier to travel with your pet. If you travel regularly with your pet, consider keeping a spare toy, retractable leash, and travel dog bowl in your vehicle so your pet is always comfortable even if his ride in the car is spontaneous. Please contact our distribution center for a wholesale price list of pet products we offer. Almost everyone has passed a thin, straggly dog that looks homeless. Perhaps, the dog is a puppy of a stray, but it could just as easily be the offspring of a house pet. Many pet owners never bother to spay or neuter their pets. Unfortunately, if they do not always walk their dogs or their dogs run away, these house pets have the perfect opportunity to follow the course of nature and get another dog pregnant. Unfortunately, many homeless dogs roam the streets, starve or are taken to the Society for Prevention of Cruelty to Animals (SPCA). Some are euthanized if they are too sick, aggressive or have other issues that make it impossible to find them homes. Responsible dog owners can help reduce the number of homeless dogs by having their pets neutered and spayed. Neutering and spaying dogs has other benefits, as well. Spaying animals can also reduce the likelihood that they incur certain forms of cancer. Neutering male dogs can make them less aggressive, make them less likely to wander, and can minimize the likelihood of certain types of tumors and hernias. If your dog is not spayed or neutered, take the precautions to make sure your dog cannot get outside your property on his own. Walk your dog on a leash regularly and make sure fenced in property is properly maintained. Essenti Enterprises, LLC has a line of durable retractable leashes that are perfect for every size dog. Our leashes have comfortable easy-to-hold handles and can easily be adjusted with the push of a button. Browse our product line for quality leashes that help keep you dog safe and reduce the likelihood of increasing the population of stray dogs. There are many kinds of dogs. Once you decide to purchase one, you need to choose a breed that meets your specifications and lifestyle. You should consider allergies, living space, whether the dog sheds, whether the breed has the right temperament around children and whether you want a pure or mixed breed. If you want a purebred puppy and cannot find one at a shelter, you may decide to purchase your dog from a breeder. It is important to purchase your dog from a knowledgeable and reputable breeder. How can you decide on the right breeder? You can find breeders by obtaining referrals. If you cannot get referrals, contact a vet, kennel club or the Humane Society for recommendations. Once you identify a breeder, make an appointment to visit him. Even if the breeder does not have puppies during your initial visit, you still should inspect the premises, talk to the breeder, and observe other dogs that may be on the premises. Notice whether the dogs on the premises appear healthy and clean. Watch the breeder to see how he interacts with his dogs. Ask where the dogs spend their time, and have a list of questions about the breed. The breeder should be able to answer your questions and show legitimate interest in ensuring that you will be a good pet owner. He may ask questions about your home life. Even if the breeder seems knowledgeable and interacts well with his dogs, ask for references. After checking the references, visit the available puppies. Review the health records of the puppy, parents and grandparents to ensure that they are free of hereditary problems that may be common to the breed. The breeder should be able to provide information about caring for the puppy and want you to return the dog if you cannot care for him. When a puppy is purchased, he will need his own dog bowl, floating rubber toys and leashes. Essenti Enterprises, LLC manufactures sturdy plastic bowls that are available in assorted styles and colors for any size puppy or dog. They also offer floating scented rubber dog toys that are perfect for energetic puppies that need to chew and play. Our full line of dog accessories can help your dog transition to his new home. Our products make it easier to care for dogs and puppies.